The Venus agricultural monitoring and environmental research satellite, built for the Israeli and French space agencies, and the advanced observation Optsat 3000 satellite, intended for use by the Italian Ministry of Defense, were launched to space early Wednesday from French Guinea. 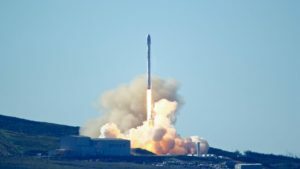 The two satellites, developed and constructed by Israel Aerospace Industries (IAI), both entered successfully into orbit, the Ministry of Science said. The satellites were launched using a Vega launcher, which weighed 137 tons at the time of launch and is 30 meters high—as tall as a building. This state-of-the-art launch system guarantees the satellite is ejected from the launcher at the precise moment for its trajectory. Vega has so far registered an impressive record of 100 percent successful launches. Wednesday morning was no different, when at 6:18am Israeli time Venus detached from the launcher. At about 10:30am, according to a statement by the Ministry of Science, Venus was expected to send its first communication to the IAI control center when it passed over Israel. Then, at around 12pm, its second communication is expected.